Let’s see how these NBA playoffs are about to set up for the Bulls: They’re currently the No. 4 seed, which would mean a first round series hosting the Brooklyn Nets, though the Nets still could fall behind Washington to No. 6. Then the Bulls would play Washington, but the Bulls still could move up ahead of Toronto to No. 3 and play Brooklyn, unless Brooklyn stays at No. 5. Then it could be the Bobcats, whom the Bulls play Wednesday in the final regular season game, if they move up to No. 6. Got that? Well, at least the Bulls know they won’t play the New York Knicks, who were eliminated from the playoffs with an Atlanta win Saturday. And then went out and outplayed the Bulls Sunday in New York in a 100-89 victory. “It was disappointing,” said Joakim Noah, who barely missed a triple-double again with 13 points, 17 rebounds and nine assists. What it all means for the Bulls remains uncertain and likely will until the final regular season game in Charlotte. With Indiana’s victory over Oklahoma City Sunday, the Pacers are now likely to get the No. 1 seed in the Eastern Conference despite their poor play the last three weeks. The defending champion Heat, likewise, haven‘t been very good the last six weeks (11-12). But they get a pass as two-time champions. Pacing themselves is the explanation. Though it has to be an internal concern as without Mike Miller and with Shane Battier and Ray Allen having sub-par seasons, the Heat isn’t the threat it once was. So where does this leave the Bulls? If the season ended the way the standings are today, the Bulls would avoid Miami until a potential conference finals. And the Heat does remain the team to beat in the Eastern Conference. But the Bulls would open the first round against Brooklyn, generally considered the toughest first round matchup for the Bulls because of their size and scoring ability of the guards. That proved fatal to the Bulls Sunday in New York in a game changed to a night start from the national ABC game. The Knicks, not known for their defense, did a good job trapping the Bulls point guards, particularly D.J. Augustin. 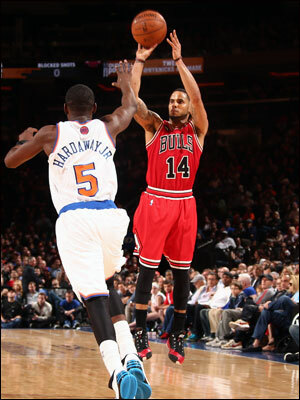 Augustin was three of 13 for 12 points with four turnovers and he and Kirk Hinrich combined for three of 14 on threes. The Bulls will see a lot of that sort of trapping defense in the playoffs because of their smaller point guards. And the Nets are good at point guard in posting up, which causes the defense to help and opens the outside. A second round series against a top seeded Indiana would be, in theory, easier than against Miami given the Pacers’ struggles and team wide uncertainty. But it would be a much more difficult first round series to win. If the Bulls were to regain third place (the Raptors have the tiebreaker as a division winner), then the first round series would be against a Washington team viewed not as threatening as the Nets. But then it would be the favored Heat in the second round if the Pacers remain in first. Obviously, with coach Tom Thibodeau we know the Bulls aren’t going to be aiming for any matchup or giving up any games. If it were me, I’d rather have the more favorable first round series, which would mean home court against Washington or Charlotte. That probably would mean moving past the Raptors, who play the Bucks and close the season Wednesday in New York. And the Knicks did beat the Raptors in Toronto last week. Chicago was led by Jimmy Butler with 17 points. But the Bulls shot 39.2 percent and were six of 22 on threes. The Nets close at home against the Knicks and in Cleveland. Brooklyn needs one win or a Washington loss (playing Miami and Boston) to clinch No. 5. Charlotte goes to No. 6 if they tie the Wizards. They trail by one game now. Charlotte cannot get to No. 5, though Washington still could. I agree. Just let us know Wednesday night. Until then you know the Bulls are going to play it out, and it wasn’t a good outing Sunday. “Defensively, we weren’t very good,” said Bulls coach Tom Thibodeau. “I liked the fight to come back. We made some good plays down the stretch (to get within six with 3:51 left and chances to cut it to three with an open Augustin three). We missed some wide open threes (another by Hinrich trailing by seven with 2:09 left). You can live with that. Two opportunities. It didn’t happen. I didn’t think the defense was poor. 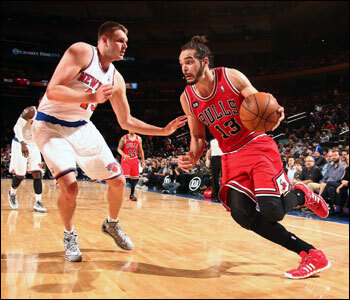 The Bulls outrebounded the Knicks 45-36, had more than twice as many steals and almost double the second chance points. I thought it was a more aggressive — and no one says this much — Knicks defense overplaying on the wings even as the Bulls do so many back door plays, trapping the pick and roll and coming with a double team from different spots. The Bulls seemed more surprised by those actions. As was anyone who watched the Knicks this season. “We were lackadaisical at times. 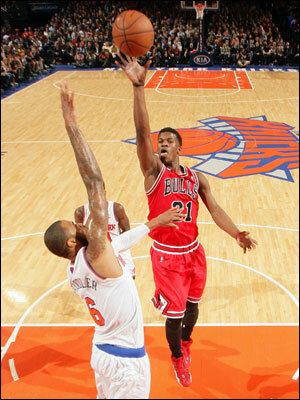 We can’t complain about it,” said Taj Gibson, who had 13 points and seven rebounds off the bench. The Bulls were led by Jimmy Butler with 17 points. Mike Dunleavy added 13. But the Bulls shot 39.2 percent and were six of 22 on threes. The Bulls attempted 11 more free throws. That’s not unusual against the Knicks, who are your state fair shooting-for-a-large-stuffed animal offense. This time J.R. Smith was carrying one around as he made five threes. He usually doesn’t, and he often takes them from where no one plays defense. But it was a wild late second quarter stretch when he made a pair and the Knicks closed the first half 9-0 to take a 45-39 halftime lead. Hardaway led the Knicks with 20 points while Smith and Carmelo Anthony each had 17. Anthony wasn’t supposed to play with a bad shoulder once the Knicks were eliminated from the playoffs. But he chose to, though he, Tyson Chandler and Smith all sat out the fourth quarter. Which probably was the toughest part for the Bulls, that they couldn’t make up that 13-point deficit to start the fourth against Cole Aldrich, who played well, Hardaway, Iman Shumpert, Amar’e Stoudemire and Pablo Prigioni. There’s much speculation and uncertainty regarding Anthony, who can be a free agent after this season and was highly complimentary of Thibodeau in interviews with New York media before the game. There were reports after the All-Star game that Noah was recruiting Anthony to the Bulls. Though with the hiring of Phil Jackson, who was at the game, it is expected Anthony will resign with the Knicks even after missing the playoffs for the first time in his career. The Bulls weren’t thrilled, either, as their seven-game winning streak ended along with the outside chance of winning 50 games. They are 47-33 with two games remaining and the last regular season home game Monday against Orlando. The Magic will be without center Nik Vucevic. It also was clear from the beginning the Knicks were taking the game seriously as Chandler drew a flagrant foul on Dunleavy setting a screen three minutes into the game. Noah had one of his end to end dashes for a score and the Bulls lead 22-19 after one quarter. D.J. Augustin and the Bulls are 47-33 with two games remaining and the last regular season home game Monday against Orlando. The Bulls seemed in control in the second quarter at 39-36 with a pair of offensive rebounds leading to Augustin scores, one a three, and Butler with a slam dunk on a slick back door cut and pass from Noah. But the Knicks had that strong close with the Bulls also a bit sloppy with the ball against pressure. The Knicks then got back to back Smith threes early in the third quarter and one from Ray Felton, whom you usually let shoot. That run gave the Knicks a 60-46 lead less than four minutes into the third quarter, and then the Bulls couldn’t make their open shots as well. Noah and Gibson got technical fouls for objecting to some of the behavior and rulings. And the Knicks kept coming, forcing some unorthodox matchups with Noah on Shumpert when the Knicks went with four guards. But the Bulls don’t always take advantage of those size matchups, and the Knicks pressured with their quickness. The Bulls had one good run left after the angry Gibson slam of the night, a regular feature. But they couldn’t make some open threes, which certainly happens, and couldn’t get the tough Hardaway out of the lane as he had a dozen fourth quarter points. If they do it to Toronto Wednesday, the Bulls could be back in third. Which would mean Washington. Unless it’s Charlotte. But Brooklyn… never mind.